Acids are significantly removed from our low acid coffee. The good acids that give the coffee its flavor and the acids that assist in the digestion are left. Coffee drinkers know how satisfying and delicious a cup of gourmet coffee can be, but they also know that it isn’t always easy on their stomachs. Approximately one out of every five coffee drinkers can’t drink coffee due to stomach upset or other uncomfortable side affects. Now, thanks to the Hevla process, that’s no longer a problem! The beans used in Low Acid Hevla coffee are exclusively Arabica and of the highest quality within that already superior classification. Hevla coffee is ideal not only for people with medical conditions relating to the digestive system, but also for those who have high-stress jobs and are at risk to develop sensitive stomachs as well as those who simply want to enjoy good health. Hevla coffee makes it possible for coffee lovers to enjoy their coffee without discomfort. Hevla undergoes an all natural steam process to remove most of the natural irritants formed during coffee roasting, which can lead to heartburn, indigestion and stomach upset. While this process removes irritants, it leaves the coffee aroma, flavor and caffeine completely intact. Hevla Coffee is a new category of coffee like decaf. Our coffee is one of the first Hevla coffees offered in the United States. In Germany, coffee going through the Hevla process has gained a 12% share of the coffee market! Learn about Hevla Coffee, and the all natural patented low acid coffee steam process. Wondermugs are fascinating color and design changing coffee mugs that metamorphosize dramatically when a hot beverage is added. Over 62 unique designs make them perfect gifts and a great mug to use at work or home–Fun for the whole family! 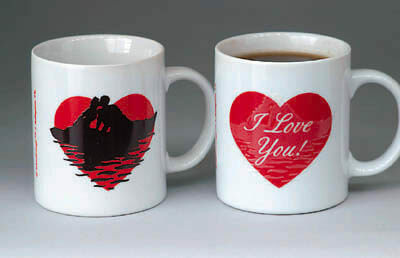 Color-changing or “thermochromatic” mugs are not new but Wondermugs has earned its singular success by combining this fascinating technology with uniquely beautiful artwork and popular themes.